Following on from our series of recipes from the Getting Fed Up blog, this week Ciara is sharing a family dish with us, based on a Turkish recipe her aunt used to cook when Ciara was a child. 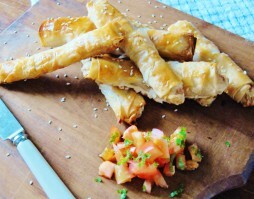 The rolls are known as ‘Sigara Boregi’, which traditionally consist of feta cheese and parsley wrapped in filo pastry. This combination of flaked Goatsbridge smoked trout works beautifully and is the perfect little treat to serve as a snack or when entertaining guests. Preheat the oven to 180°C/350°F/gas mark 4. Grease your baking tray with some of the oil. Combine the Goatsbridge smoked rainbow trout, cream cheese, milk, parsley, lemon juice and chili in a bowl. Season with salt and pepper. Keep the filo sheets you are not using covered with a damp cloth to prevent them from drying out. When you are ready to fill them, lay one sheet of the filo pastry out on a flat surface and add about a tablespoon of the trout mixture. Place it at the end of the sheet leaving room at either side of the edges. Be careful not to overfill the roll or the mixture will start to ooze out when it is in the oven. Fold in the edges of the filo pastry sheet in on top of the mixture and start to roll it up (so that it looks like a cigar). Use your finger to dab the end of the pastry with a little water which will help to seal it. While you continue with the rest of the rolls, place a damp cloth over the completed rolls so they do not dry out. Transfer the finished rolls to the greased baking tray when you are ready to cook them. Mix the remaining oil with the egg and brush it over the pastry before sprinkling over the sesame seeds. Bake in the oven for 20 – 25 minutes until golden brown. Serve with a little tomato and chopped parsley for decoration. If you liked this Goatsbridge Smoked Trout recipe with a Turkish twist, you can buy our smoked rainbow trout from our online shop here or in all good Irish supermarkets, including Supervalu and Dunnes Stores as well as specialist shops around the country . For more Goatsbridge trout recipes, news or competitions sign up for our newsletter.